Mount-It! sit-stand workstation wall mount is a complete workstation that saves space and promotes health. Move from sitting to standing in mere seconds with our easy-to-use gas spring arm system. To be more productive, focused and less stressed in this new working style. - Detachable VESA plate makes the installation much easier by screwing into your monitors and then sliding back onto the arm. - Gas spring counterbalance floats the monitor with a light touch for a customized placement to match your viewing needs anytime. - Full-motion mechanism swivels, tilts and rotates the screen to optimize the freedom of different reading angles. - Micro level adjustment enables precision alignment of the keyboard configuration. - Built-in spring gauge can be adjusted to suit various monitor weight. - Built-in cable duct hides cables inside the arm for clean clutter-free look. - Foldable keyboard tray saves space when not in use. - Secondary storage tray offers ample accommodation for the cup, phones, notes, stationery, etc. - Ledge at the end of keyboard tray securely holds keyboard in place. - Additional CPU mount helps to hold the CPU on the wall to save more space for working area. 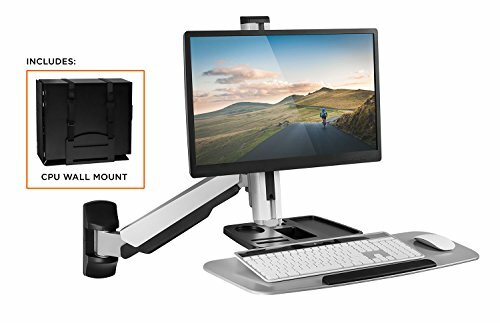 MOVABLE WORKSTATION - Improve your posture as you work comfortably while sitting or standing with this Adjustable Wall Mount by Mount-It. This wall mount by Mount-It! has a full motion system that offers a wide range of movement, letting you personalize your wall stand. You can also shift the monitor from landscape to portrait mode for more convenient use. VERSATILE MOUNT - Use this adjustable wall mount for your computer monitors and keyboards, mouse, notebooks and pens, laptops, and other necessities that you use at work. It includes two trays and a durable mount. An articulating arm allows you to turn, tilt, and rotate for optimal positioning. It also comes with a gas spring arm that smoothly glides up and down for easy transitions as you sit or stand. COMPATIBILITY - This wall mount supports 18- to 27-inch monitors. It supports most monitor types, so you don't have to worry about the brand and its size. Make sure that your computers have a VESA 75 or VESA 100 bolting pattern. HEAVY-DUTY STEEL CONSTRUCTION - The frame of this wall mount is constructed of heavy-duty steel and is powder-coated to enhance its overall attractiveness and durability. You can put laptops or computer monitors and other office supplies on this wall mount. It has a load capacity of up to 28.6 pounds. DIMENSIONS - This Adjustable Wall Mount has dimensions of 31 x 16 x 8 inches, big enough for your computers, laptops, and other belongings. The trays that are included measure 24 x 16 inches each, perfect for your keyboard, mouse, paperwork, and even your cup of coffee.